“I wish to take this occasion to implore you, Holy Father, in the name of the shepherds and the people of God, in the most attentive, humble and respectful way, to authorize the opening of the process so that St. Oscar Arnulfo Romero be declared ‘doctor of the church,'” Archbishop Escobar said Oct. 15. 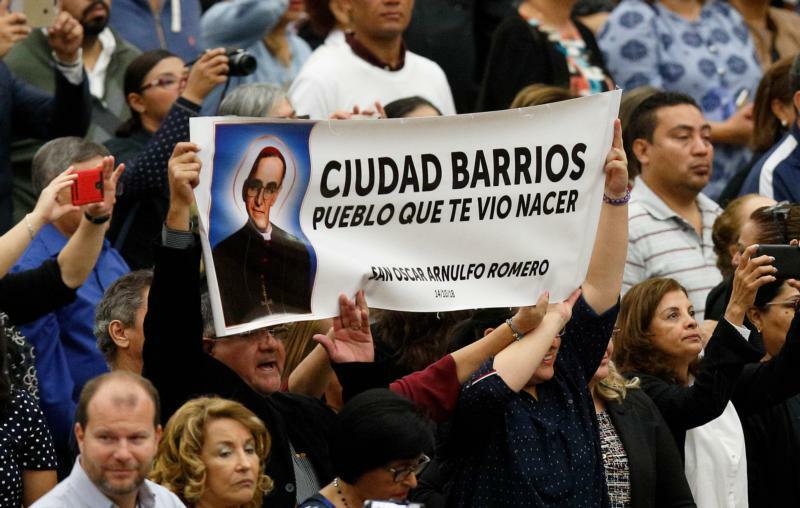 The Salvadoran archbishop’s request was met with cheers and applause from an estimated 5,000 Salvadoran pilgrims during an audience with the pope the day after the martyred St. Romero became El Salvador’s first saint. If St. Romero is declared a “doctor of the church,” it would indicate that the newly canonized saint’s writings are considered to offer key theological insights for the faith. Earlier, the Salvadoran pilgrims had given thanks for St. Romero’s canonization at a Mass celebrated in the Vatican audience hall by Salvadoran Cardinal Gregorio Rosa Chavez, who was a close friend of the slain archbishop. The pilgrims’ arrival in the audience hall coincided with the arrival of bishops, cardinals and observers making their way upstairs to the meeting of the Synod of Bishops. A priest making his way to the synod passed a group of Salvadorans and said, “Viva San Romero!” to the pilgrims’ delight. Greeting the pilgrims, Cardinal Rosa Chavez, auxiliary bishop of San Salvador, expressed his joy at seeing so many Salvadorans from around the world in Rome for the canonization. “Yesterday, we saw the square full of blue and white (the colors of El Salvador’s flag). We took over Rome!” he said. Once the pope arrived, Archbishop Escobar invited him to visit El Salvador, another request that caused the pilgrims to erupt in applause. “We invite you to visit Archbishop Romero and we ask in that same occasion you have the goodness of beatifying our beloved Father Rutilio Grande. To have Your Holiness in our country would be an immense grace of God for our people,” the archbishop said. In his address to the pilgrims, Pope Francis did not respond to any of the archbishop’s requests. Instead, he focused on St. Romero as a role model for the faithful and leaders of the church in El Salvador. He called on them to care for the “holy people of God” in El Salvador and to learn from the life and death of their saintly archbishop, who was never far from his flock. Among the pilgrims present at the Mass and papal audience was Cecilia Rivas, whose miraculous healing paved the way for St. Romero’s canonization. In 2015, Rivas was pregnant with her youngest child and suffered a life-threatening illness, known as antiphospholipid syndrome, and was not expected to survive. When her husband, Alejandro, prayed to St. Romero to intercede for his wife’s life, her condition improved, and she was healed through his intercession. The day before the audience, the family briefly met the pope, and their eldest son gave him a portrait of St. Romero painted by the children of his school. One of the best parts of the trip to Rome, Rivas said, was visiting the tomb of St. Peter. Rivas also said that although “the church is going through a rough time right now,” she is certain that it will flourish if it is “pruned” like a tree. “Yes, the church will come out stronger and more beautiful,” her husband added. As the pope arrived for the audience, the crowd began chanting, “Francisco, buen pastor. Te quiere El Salvador” (“Francis, good shepherd. El Salvador loves you”). One of those chanting was Celia Diaz, an elderly lady, who reached out to the pope and kissed his hand. Her energy even surprised Pope Francis.